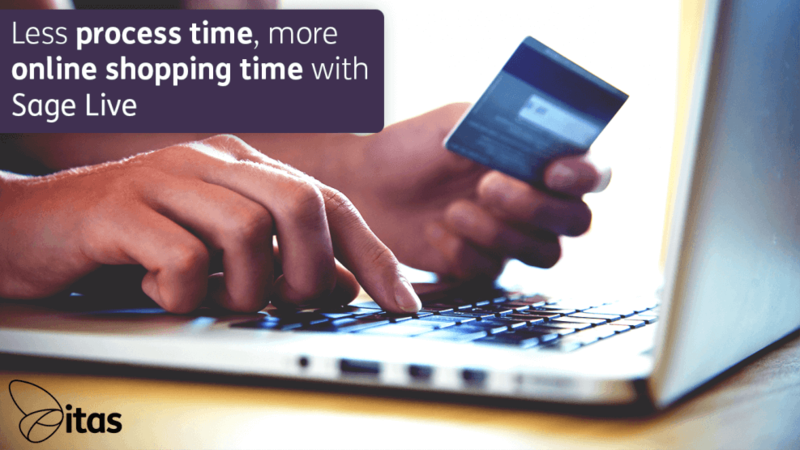 Less process time, more online shopping time with Sage Live! Ever thought there’s not enough hours in the day? Not even to complete your to do list at work, let alone have a quick 15 minute break to grab a coffee to go and the new October edition of Vogue. Stop your panicking, hold fire and grab a muffin with that coffee because Sage Live is here to help! So what features does Sage Live offer to save this precious fashion browsing time? In this blog I have four fabulous features to decrease your process time and increase your available shopping time…don’t tell the boss! If you have ever seen Sage Live lightning interface before, you will know that it has your main tabs across the top row and within each a sub tab, for ease of navigation. So for example you will have the Sales as a tab on the top row and the Sales Invoice tab will be found underneath. For each of these tabs, they are displayed in a list view on the screen. This list will include all items created in that subtab. So, all Sales Invoices will be listed within the Sales Invoice subtab list view. Each list view comes with standard default lists Sage has created for you to use and the option to create your very own. This feature is available on every tab within the Sage Live system, allowing you to create many customisable list views to suit your daily tasks. It allows you to pick and choose which data fields you want bringing in as a column on display. The Search box feature is one that provides the easiest of navigation tricks. This search box gives you the freedom to enter in a variety of key words or numbers. This provides you with suggested results throughout the entire Sage Live system. This is something we at itas, find really useful for finding specific transactions within the system, when trouble shooting on our Support desk. Sage Live also provides many different types of Reports for you to view your data. The vast amount can be time-consuming, especially if you cannot find that perfect Report. Using the Search box feature, will give you that simple solution to locating that favourite Report in seconds! How dangerous is that subscription button on your favourite online shops. You can hear the sound of your credit card crying from your Louis Vuitton as you click the button ‘sign up’! Have no fear the subscription feature is available in Sage Live Reports but at no cost for your card to have a melt down! There are five types of Reports within Sage Live available for you to analyse your data. Within each of these types, there is a vast amount of standard Reports ready for you to use from day one. But how do you make your way through this jungle of reporting tools? Behold the Subscribe tick box! Within the Other Reports screen, you can select your favourite Reports and set up a Subscription. This tells the system to run and send the results on a daily, weekly or monthly basis! The final and most fabulous of the four time saving features in Sage Live, the Multiple Transaction Import. This feature allows you to import a list of mass transactions from an Excel CSV file, straight into the Invoice list screen in Sage Live. This method of data input is available for all transaction and journal types within the system. This process takes a little preparation (I mean when would you step out for cocktails without a little application of lip gloss or a hair fix right?) Our skilled technical team can assist you with or our Training specialists can walk you through the process on an online training session. The setup is dependent on exactly what data you would like to bring into Sage Live to ensure the Excel file is mapped over correctly to Live. Once this is up and running you’re ready to go! The process is as easy as navigating to the transactions screen and clicking the import file, selecting your CSV and pressing Import! Voila! Is that the smell of fresh ground coffee and sight of a comfy leather chair? Using these features within Sage Live could save you heaps of time with your day-to-day tasks and processes by making them easier, quicker and more efficient. While saving time you are also making the process automated which increases the accuracy and time punctuality of your work. These features will allow you to concentrate on other aspects of your daily role and ensure you can focus on higher priorities. Not to mention give you that little extra time to flick through the November issue of Cosmopolitan with an actual ‘sit in’ coffee and muffin! Home » Sage Blog » All Sage Blog Posts » Less process time, more online shopping time with Sage Live!